Bernie Sanders' supporters rally with lighted signs Saturday. Public health lecture addresses comprehensive opioid addiction treatment. Students learn the definitions, warning signs of human trafficking. IU considers safety in study abroad programs. Eighteen-year-old Jerrold Parker died of gunshot wounds over a Twitter feud, police said. 40 recruiters and professionals engaged in conversation Thursday night. Minority retention in need of attention, campus diversity study reported. The bill would have repeated RFRA with no protection against LGBT discrimination. 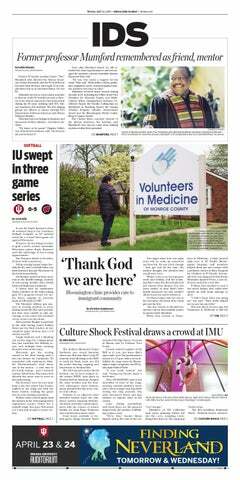 Albrecht Holschuh can’t remember a Thursday when he wasn’t met by protesters on the periphery of Planned Parenthood in Bloomington while arriving for his shift. The University will receive several assessments based on compiled data from the last five years. Eric Love, despite being a champion of campus diversity, wasn't given a counteroffer by IU when Notre Dame called. Love was not the first — or the last — to leave the department. Students and staff still question why DEMA has let this happen. Following the grand jury’s decision to not indict Ferguson police officer Darren Wilson for the death of Michael Brown, experts and amateurs alike have analyzed the issue from countless perspectives. Although I also possess an opinion about the legality surrounding the grand jury proceedings, I will not delve into the mechanics of the death of Michael Brown, as others with more expertise and sophisticated prose have done so. Trouble lies just beyond the southern border.Mexico faces internal strife as the populace riots against government corruption in response to the kidnapping and alleged killing of 43 students in the state of Guerrero. The United States is sending thousands of troops overseas under the pretext of collaborating with Iraqi forces to stop the threat of the terrorist organization Islamic State of Iraq and the Levant, also known as ISIL. As of Oct. 25, the Ebola virus has sickened over 10,000 people around the world and killed nearly half of those infected. Florida is at it again. 'More than cream and crimson"
It’s that time of the year again where everybody and anybody affiliated with IU gathers around the town square to show their school spirit: IU Homecoming. As Americans, it is our duty to protect our borders and defend ourselves against the threat of Ebola. The recent string of domestic violence incidents involving National Football League players has rocked the sporting world and revealed the indifference with which our culture deals with violence.